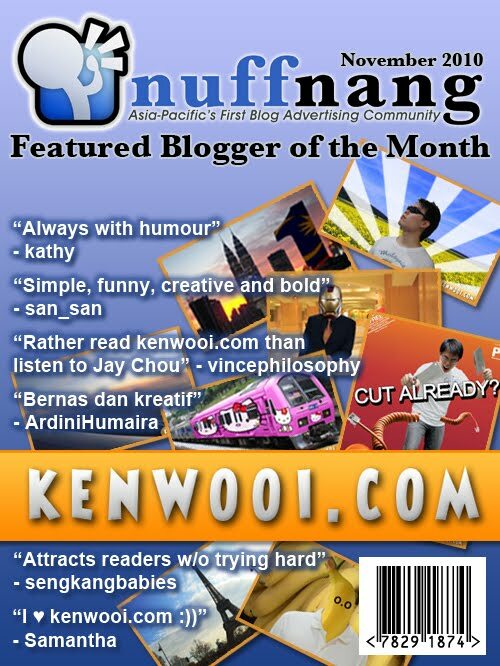 Hey know what, the author of kenwooi.com is Nuffnang’s Featured Blogger of the Month for November 2010! Remember the testimonial request for a “secret project”? Well, THIS is the project and I’ve featured certain readers’ testimonials. Go ahead and read the featured blogger article on Nuffnang website. Anyway, I received lots of wishes for that. So I’m taking this opportunity to thank you all – every comment, message and reader has made this journey for me all the more rewarding! Appreciate that! Oh yeah, check out sengkangbabies’ entry – “About kenwooi.com” too. tak percaya! nama dni ado kat atas tu.. wohooo teruja! dni tumpang berbangga dengan kejayaan kenwooi. Congraz, although it’s a bit late. But you deserve it. Keep it on! Congratulations! Way to go, boy! Keep it up! Congratez Ken!! ^u^ Have seen it earlier @twitter. Congratz Ken! with the cool posting in your blog, you deserve it..
by the way, hope can meet u in NN event when you at KL.. see ya! you does deserve it ! u deserve it actually, u r a very good blogger. Congrats! You deserve it. Well done. LOL I see a little extract from my testi XD Nyways, congrats Ken! Nah, don’t deny this, just for once, Ken, you are one big FAMOUS BLOGGER! congrat bro, i saw u at nuffnang…. suka singgah blog en.ken sebab ada tarikan tersendiri dengan jokes dan gambar super imposed yg memang boleh buat sy senyum je! hehehe..
LOL Grat, I must say. CONGRATULATIONS BRO! KEEP UP THE GOOD WORK! Btw, have you watch Hachiko yet? Im going to start reading your blog! yooo, congratssss!! Just saw you feat. in nuffnang in nov. It was so awesomeeeee!!!! Whoaaaa Ken you sure have come a long way. That is such a great achievement!! Congratulations!! I want to be one too! Congratulations, Ken :D You deserved it. congrats orange lover and i think this is your shortest entry I’ve ever read! woah! Blogger of the month Congrats!